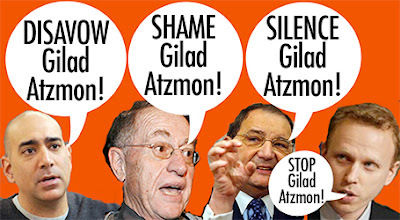 truthjihad.com blog: I hereby REFUTE Gilad Atzmon! I hereby REFUTE Gilad Atzmon! Yet nobody will even try to refute him. What's wrong with these people?! Don't miss Gilad Atzmon's jazz jam with Abandon Control, livestreaming TONIGHT, Monday, May 1, 7:30 to 11 p.m. at AbandonControl.com and their FB page. Please note that this was originally an "official" event with a room reservation. Unfortunately, the usual suspects apparently complained, and our reservation was canceled. So Gilad and I are going to do what so many Union members and their guests do: meet in the Rathskeller for some spirited conversation. Hope to see you there! This will be a historic event. Why? Because, as far as I know, nobody who disagrees with Gilad has ever seriously tried to refute him. They insult him. They deplore him. (Gilad is the original "adorable deplorable.") They do everything they can to get his speaking engagements canceled. Failing that, they picket him and protest him and whine and complain and call him names. They try to silence him, over and over, and repeatedly fail. But the one thing they never, ever do is explain how and why Gilad is wrong. I have read Gilad's amazing new book Being in Time: A Post-Political Manifesto...twice. It is a terrific, timely contribution. Gilad slices, dices, and eviscerates political correctness, identity politics, and leftist ideology in general. He explains many things, including the rise of Trump (and Brexit, Le Pen, etc.) quite persuasively. But ultimately I think Gilad's analysis misses the deeper significance of the decline of leftism and the rise of neo-fascism. I think he is too hard on leftism, because neither he nor most leftists understand the roots of that ideology. And I think he is too kind to neo-fascism, because he (like pro-fascists and most anti-fascists for that matter) doesn't really understand fascism either. I am really going to enjoy refuting Gilad. This is going to be fun! A huge shout-out of thanks to all the Madison liberals and leftists who refused to accept the Gilad Atzmon Debate Challenge and forced me to do the job myself.